So before we get into my Cyanotype Project, we’ll cover a little history. 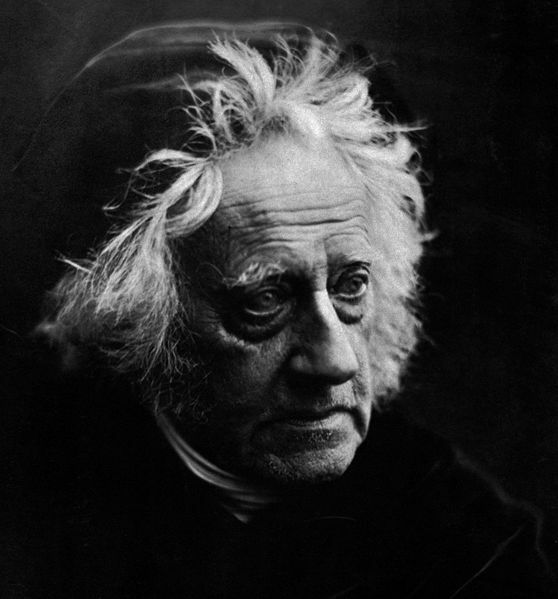 The English scientist, astronomer and botanist, Sir John Herschel discovered the Cyanotype in 1842 as a means of ‘copying’ his notes. In the early days the paper was coated with iron salts and then used in contact printing. The paper was then washed in water and resulted in a white image on a deep blue background. 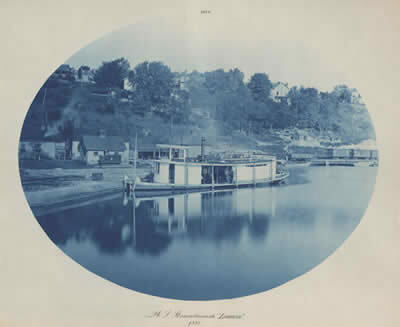 The cyanotype was the first simple and practical non-silver iron process discovered a mere three years after the “official” announcement of the discovery of photography. 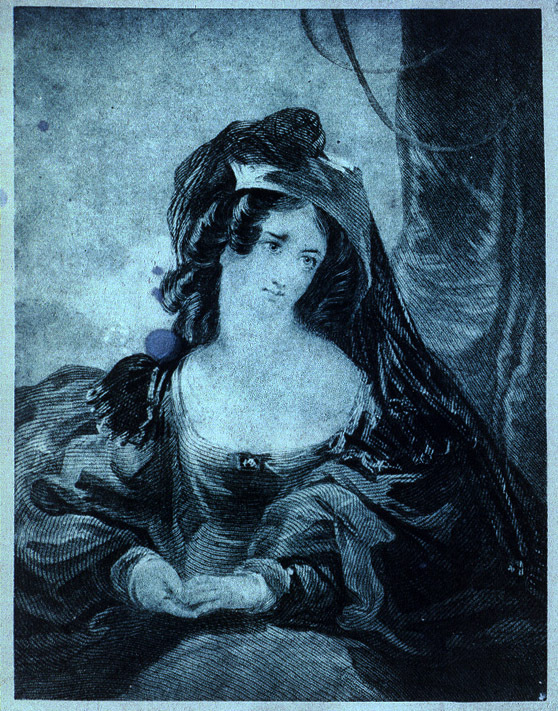 The cyanotype provided permanent images in an elegant assortment of blue values. Along with the Cyanotype the precursors of the modern day blueprint process and variations such as the chrysotype (gold print) and the platinum process on the basis of the light sensitivity of platinum salts, Herschel managed to fix pictures using hyposulphite of soda in 1839, which is the still used today and better known as ‘hypo’. Herschel also gave us the words photography, negative, positive and snapshot. Apart from his great contribution to photography he originated the use of the Julian day system in astronomy; he named seven moons of Saturn and four moons of Uranus and investigated colour blindness and the chemical power of ultraviolet rays. It was Anna Atkins who brought the Cyanotype to photography. 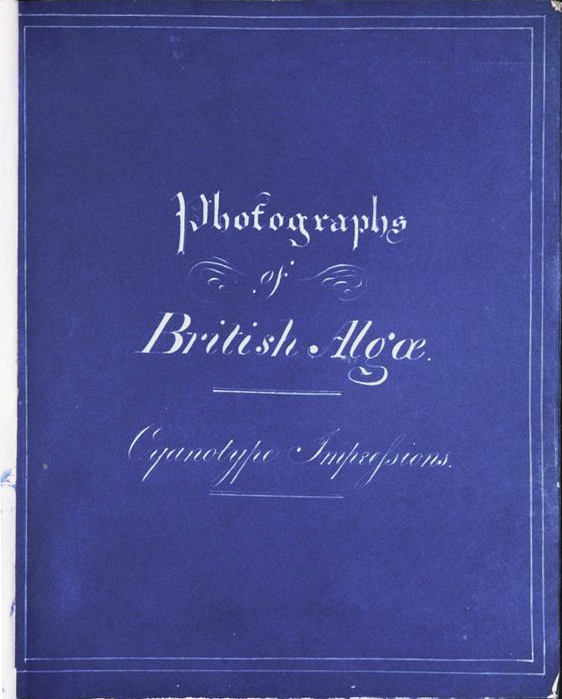 In 1843 she began publishing folios of her photogenic drawings and in 1850, she began to publish more comprehensive collections of her work, completing a three volume anthology in 1853 called “Photographs of British Algae: Cyanotype Impressions“. These books contained 424 handmade Cyanotypes images. These were the very first published works to utilize a photographic system for scientific investigation and illustration. Atkins placed specimens directly onto coated paper, allowing the action of light to create a silhouette effect, a process called a photogram. Apart from her other works, she also created images of feathers and ferns. 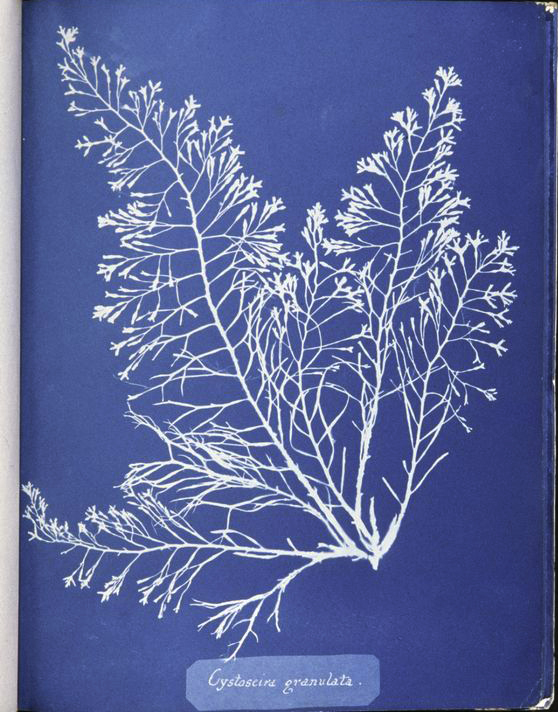 By using this photogram process, Anna Atkins is regarded as the first female photographer. Anna also experimented with the Calotype process. Another, relatively unknown early Cyanotype artist was Henry Peter Bosse. Henry was a prescient photographer in that he foresaw and adhered to aesthetic values which have come to define the work of German photo-journalists around the world. Straight forward composition and a concern for the efforts of man characterize Bosse’s photographic point-of-view, as it would come to be the basis of foto-reportage. Bosse took great care when making his presentation albums. 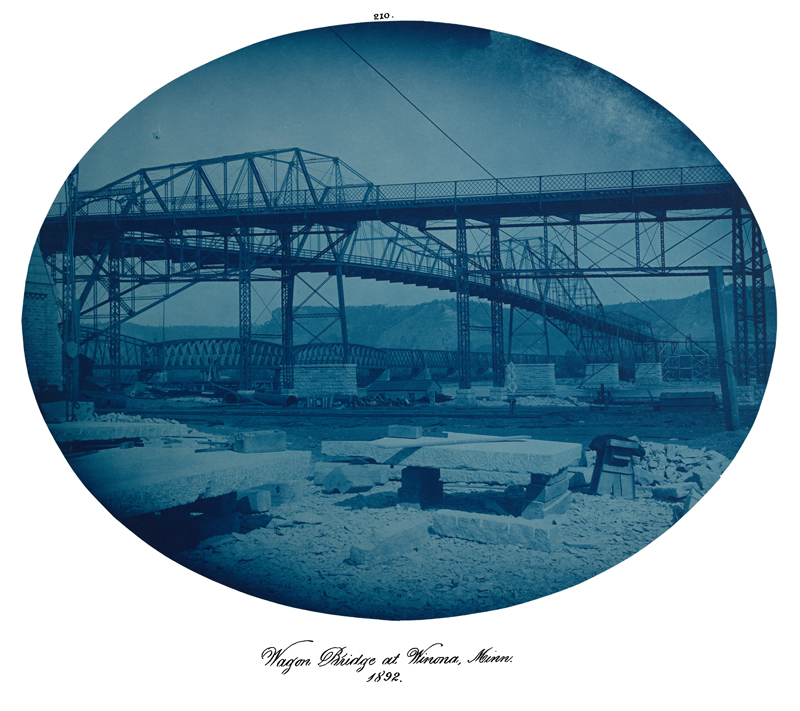 He foresaw the need for color: the intense moody blues of his refined cyanotypes reflect this concern. His cyanotypes were exposed with large glass plates and printed on the finest French cyanotype paper, each sheet off-white measuring 14.5″ x 17.2″ and bearing the watermark Johannot et Cie. Annonay, aloe’s satin. The albums are leather bound. Beyond technique, in his appreciation for railroad bridges and structural steel, Bosse stood at the forefront of German appreciation for photographic look books concerned with the hand of man, modern architecture and urban design. The Cyanotype process became popular with pictorialists, for whom a commercial paper called ferro-prussiate was marketed. The cyanotype process has remained virtually unchanged since its invention but a few variations have been developed, one of which is the New Cyanotype II developed by Mike Ware. Today, there appears to be resurgence in not only the Cyanotype process, but also many of its historic brethren processes. Simple easy to use Pre-coated papers under the names “Sun Art” and “Super SunPrint” are available from Amazon.com and other sources and both Liquid and Dry Chemical Kits including the New Cyanotype II kits are available from various sources including Amazon.com and Photographers Formulary. Cyanotype – The ProjectBetter but not so Blue!